43.1 Gay Boomgaarden is taking control. We need to have a proper planning meeting asap, but for now we will stick with your plan to use this rec room as a base. 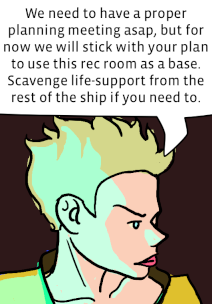 Scavenge life-support from the rest of the ship if you need to. 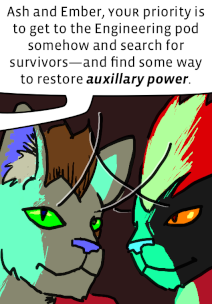 Ash and Ember, your priority is to get to the Engineering pod somehow and search for survivors—and find some way to restore auxillary power. 43.3 Dev interjects. In the background Root is fiddling with one of the inert game tables. Ma’am, what about sensors? 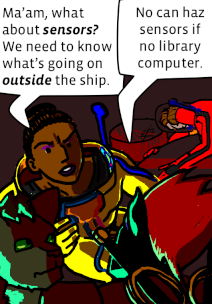 We need to know what’s going on outside the ship. No can haz sensors if no library computer. 43.4 Suddenly the table Root was fiddling with lights up with the company logo. Holographic game tables are in the recreation deck set from Star Trek: The Motion Picture. The Propspero is a new build and has some gadgets that won’t make it in to the Enterprise for another 5–10 years. The futuristic Acorn Computer logo is completely stolen from one Dave Jeffery designed for the Acorn emulator on GNU/Linux. With apologies to Gene Roddenberry and the many professionals and amateurs who have created the Star Trek universe over the years. 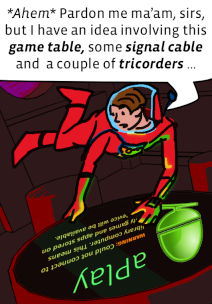 This silly webcomic is not endorsed, sponsored or affiliated with CBS Studios Inc., Paramount Pictures Corp or the STAR TREK franchise. STAR TREK and related marks are trademarks of CBS Studios Inc.